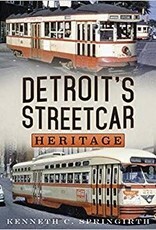 Detroit's Streetcar Heritage is a photographic essay of the Detroit, Michigan, streetcar system. Replacement of slow moving horsecar service began with the opening of an electric street railway by the Detroit Citizens Street Railway in 1892. By 1900, all of the Detroit streetcar systems were consolidated into the Detroit United Railway (DUR). Following voter approval, the City of Detroit purchased DUR in 1922, becoming the first large United States city to own and operate public transit under Detroit Department of Street Railways (DSR). Between 1921 and 1930, DSR purchased 781 Peter Witt type streetcars. Although DSR purchased 186 modern Presidents' Conference Committee (PCC) cars between 1945 and 1949, many streetcar lines were converted to bus operation. The last streetcar line on Woodward Avenue was converted to bus operation in 1956 with 183 PCC cars sold to Mexico City. 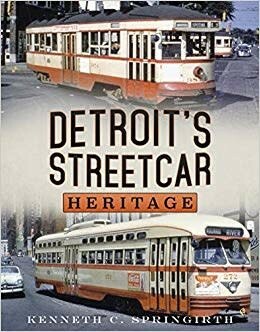 Detroit's Streetcar Heritage documents the city's streetcar era plus scenes of the PCC cars in Mexico City, the Washington Boulevard Line which operated from 1976 to 2003, and the QLINE streetcar which opened in 2017 on Woodward Avenue linking Grand Boulevard with downtown Detroit.